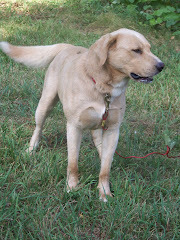 Gibby now has a double length cable, he can reach the whole length of the back yard. Now it's harder for me to play with him, I am very leery of being caught by that cable. When I back off out of his way, he comes at me on his hind legs with his front legs up and waving - reminding me of a great big teddy bear. When he wants me to pet him, he runs to the end of the cable and then lets the cable hold his upper body back while he swings his rear end around and sits right next to me. His timing is so perfect, he doesn't knock me over. He only gives me a moment to hug and pet him, then he's off again at a run. He has new area to explore, but somehow in all that extra space we lost his kong. I had trouble trying to look for it because I had to keep alert to the approach of the cable. George was in the yard when Gibby did one of his fast run-arounds and the cable wrapped around George's feet - he did quite a dance to get loose before he lost his footing. That was one skillful dance I wish I had caught on camera. Today we had one of those miracles that makes farming exciting. After raising the five little Aracauna chicks, almost catching my mother's house on fire with their heat lamp, discovering that one of the chicks was a rooster, having that rooster escape and run me ragged around the barnyard, and waiting and waiting, today, FINALLY, the first egg arrived! 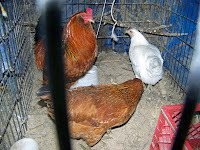 It is so different from the eggs laid by the other hens - it's half as big and it's gray. 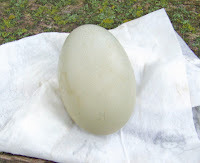 I called it green, but the camera thought it was gray and it looks very gray and small in the egg box with the super extra large brown eggs.